Try on black. This little pond is really getting a workout from my camera. I usually pass it on my morning walk right as the sun really breaks over. This morning, with a little fog, this wood duck appeared all alone on the pond. Right after grabbing this shot, off he flew. Sure was lucky. this is so gorgeous.Wood Ducks are so shy.Beautiful capture! STUNNING! Love it especially on black. Beautiful pose for the shot. Great color and lighting. Very nice capture. Love the color. Fantastic capture with great silhouettes and fabulous golden tones. Love the color and the silhouettes! Fav for me! Feels like I'm peering into the duck's private world, beautiful. Milanie, this is so beautiful! What a capture. Several days ago you asked about where I found the old ink bottle. In last year's Macro March project, I wanted to do 'ink' for "I" so went on a hunt through several antique shops in search of both a ink bottle and a fountain pen. I now have a box labeled "365" that holds my collection of treasures that either have been used for pictures or might come in handy in the future. Thanks for the compliment shared on the Quill photo. Wow stunning colors and silhouette of the wood duck Milanie! Great timing.......your morning walks really provide you with some amazing photos! This is gorgeous, love the light. You nailed it ... a fav! The colors and silhouette are breathtaking! Beautiful color and the fog just enhances the entire scene. this is just gorgeous Milanie! Love the warm colors of the sun and the little bit of fog just adds to the shot!! Wow, love the tones in this. Love it. 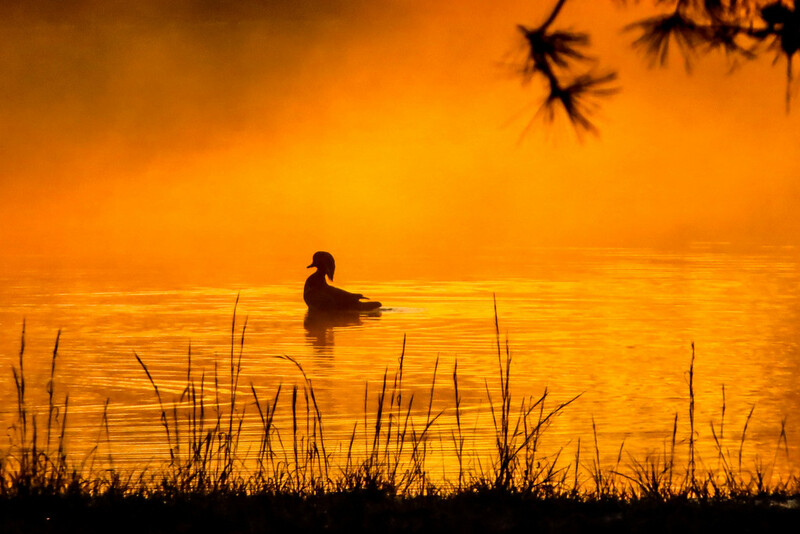 Gorgeous photo... lovely tones, colors and silhouette. Gorgeous! The warm, monochrome orange and the silhouettes are simple and stunning. Such an amazing color and silhouette! I faved! Wow, what a beautiful shot. Instant fav! Congrats on making TT! Well deserved! Beautiful subject and well composed! Congratulations on making the Top Twenty Milanie! FAV! Saw this on TT and it was my favorite shot. Fav and pin on this beauty. Congratulations. @cimes1 Thanks, Carole. I was SO surprised and humbled with so many fantastic photos on this site. But it's because all of you put it there and for that I'm so grateful. @lynnb Didn't know until I saw your comment. Thanks, Lynn - I'm so honored that others really liked it, too. @skipt07 Thank you, Skip - just really surprised me. I am so thankful for the many viewers that took the time to look and comment and fav it. When I first saw the shot on my computer, I thought it was pretty neat (all timing) and hoped others would enjoy it. Many thanks for all your comments. @sunnygreenwood I'm ordering a copy now - think it would go well in this one spot now that you mention it. So glad you liked it! And I do so appreciate your lovely comments on my shots. I don't thank people nearly often enough for the time they spend commenting, but I love reading them and looking at their pictures. What a wonderful photo. That orange light shimmers. See what you can do when you get up for the sunrise! Congrats on making the top 10.